The statistics module separates model outputs ( e.g., runoff from a Subcatchment) in to events, performs statistical analyses, and reports basic statistical information including extreme values (i.e., minimum and maximum), the first three moments (i.e., mean, standard deviation, and skewness), frequency and duration of an event, exceedance frequency, and return period. This statistical tool can be used only after running standard InfoSWMM H2OMap SWMM InfoSWMM SA model. The Output Statistics Manager dialog is shown below. It can be launched from the InfoSWMMH2OMap SWMMInfoSWMM SA Tools menu -> and select the Output Statistics Manager command. Contents of the Output Unit Manager dialog boxes are described below. Element Types Select the element type (e.g., Subcatchment, Junction type, Link type, System, etc.) you wish to analyze. Please note that only the element types available in your InfoSWMM model will be activated. As an example, if your system has no divider, "Node:Divider" will be inactivated (i.e., grayed out). Select Elements Graphically select elements for which to generate statistical summaries. Use Domain Generate statistical summaries for elements in the Domain instead of manually selecting elements. 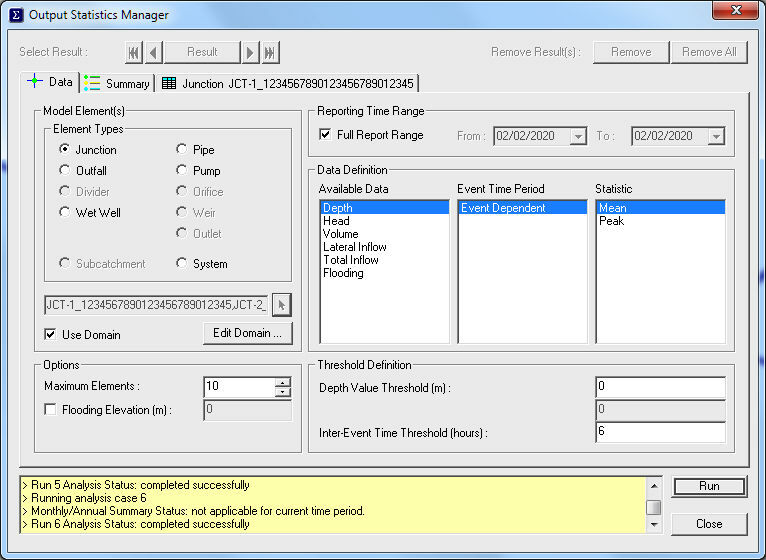 Reporting Time Range This enables the user to select the time span to be considered for the statistical analysis. For example, a modeler who has run InfoSWMMsimulation for two year duration may wish to run the statistical analysis for the entire two year duration, or only for short duration (such as one month). Check the "Full Time Range" option to run statistical analysis for the entire duration. For shorted duration, specify the "From" and the" To" dates. Available Data Choose the output variable to be analyzed. List of the output variables varies with the selected system elements. Event Time Period Here, one may specify the period over which an output data needs to be aggregated to conduct the statistical analysis. As an example, if the InfoSWMM model being analyzed has a report duration of one year or more, the modeler has the option to carry out the statistical analysis using event periods of "Event Dependent", "Daily", "Monthly", or "Annual" event time period. Note that the event time periods displayed in the window depend on the report duration. If the report duration is less than a day, the event time period that will be listed in the window is "Event Dependent" alone. In the contrary, if the report duration is a year or more, all the available event time periods ( i.e., "Event Dependent", "Daily", "Monthly", or "Annual") will be listed. Threshold Definition Allows the user to set criteria for event definition. Variable Value Threshold – this threshold must be exceeded for the variable to be considered as non-zero over that event duration. Integrated Variable Value Threshold – this input may be used along with flow (e.g., runoff, losses, ground water flow, link flow, inflow, etc. ), rainfall intensity, and pollutant concentration. Essentially, it is similar to Variable Value Threshold except that it is defined in terms of flow volume ( e.g., ft3), rainfall depth (e.g., inch), and pollutant mass ( e.g., kg).Value of the variable must exceed this threshold for the variable to be considered as non-zero over that event duration. Inter-Event Time Threshold – this input is required only for "Event Dependent" Event Time Period option. It is used to break down an output variable in to independent events. It dictates minimum duration of time the output variable has to take value less than Variable Value Threshold/Integrated Variable Value Threshold for the next non-zero value to be considered as an independent event. As an example, consider the rainfall depth given below. Assume that the Event Time Period selected is "Event Dependent". Also assume that the Inter-Event Time Threshold used is 1.5 hour. This implies that if it stops raining for more than 1.5 hours and then starts to rain, the next rain will be considered as separate event from the first rain. From the above rainfall data, it rains for the first two hours and stops for the next two hours. Since it did not rain for two hours, which is greater than inter-event time threshold of 1.5 hours, the first two hour rain can be considered as an independent event. Like wise, after two hours of no rain, it rains for one hour, stops for an other hour ( i.e. less than 1.5 hours), and than starts to rain. Therefore. the rain from hour 5 to hour 7 is considered as one event. Therefore the above rain data is separated in to two rainfall events. · Flooding Elevation – Applicable only to nodes. This input variable is used to generate flooding stage-duration curve for a node to simplify review of flooding information. Period of time during which head at a node exceeded the flooding elevation is recorded and plotted against the head. The stage-duration information is also given in tabular form. · Maximum Elements – Specify the maximum number of elements to be included in the statistical summary. Change the view to display a summary report of the next element. Change the view to display a summary report of the last element. Change the view to display a summary report of the previous element. Change the view to display a summary report of the first element. Remove Removes statistical analysis results for the highlighted element. Remove All Removes statistical analysis results for all elements. Result Switches to the Results Tab for the currently highlighted element. Run Executes the statistical analysis and makes data available to all of the reporting options. One typically carries out the following steps when using the output statistics module. Select the system elements for which the statistical analysis is performed. The specific elements should be graphically selected by clicking the icon by using a Domain. Specify the time span to be considered for the analysis (e.g., the entire simulation duration, or part of the simulation duration). Check "Full Time Range" if you wish to consider the entire simulation duration, otherwise specify the "From" and the "To" dates. Select the output variable (e.g., flow, depth) to be analyzed from the "Available Data" window. The variables listed in the "Available Data" window vary with the system element selected. Select event time period (e.g., event dependent, daily, monthly, or annual). The available options depend on the report duration. If report duration is less than a day, the only event time period that could be used is "Event Dependent". If the report duration lasts for more than a year, all event time period options (i.e., event dependent, daily, monthly, annual) will be activated. Specify the desired statistical summary (e.g., mean, peak, total, duration, inter-event time, etc). The available list varies with element type and the output variable selected. Define event threshold and inter-event time threshold. Variable value threshold and integrated value threshold define the minimum value to be exceeded for the variable to be regarded as non-zero for that event. Inter-Event Time Threshold is required only for "Event Dependent" option of defining Event Time Period. Run statistical analysis and review the statistical summary. Once all the necessary inputs are specified, you may run the statistical analysis and review results.